How do Sky Lanterns Work? How does these things withstand wind and fly only in upward curved path? I've heard that these things are made up of paper. Why the fire inside doesn't burn the paper around and up top? Getting sky lanterns to fly is not easy. I was successful with one; and failed with the other. 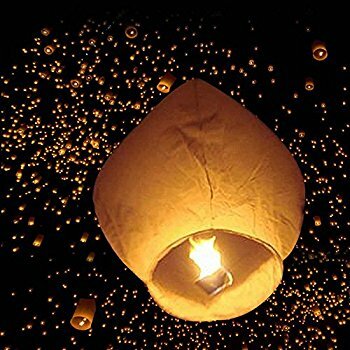 The sky lantern has a small container that contains solid inflammable material. When the flame is lit - it heats the air around it causing the lantern to rise up and fly away. The principle is the same as that for a hot air balloon. If one is not careful, the sky lantern will not fly. The paper will burn and the lantern will fall to the ground. While lighting the fire, and while the air is heating up; care should be taken to avoid burning the paper. This is done by holding the paper in position and stretching it out. When the air heats up, you can feel the lift because the lantern will try to fly. You let go at that time. When they burn and fly off, they do look beautiful.